​Oktobrina, a Nenets girl, holds a yearling reindeer at her family's winter camp on the tundra. Yamal, NW Siberia, Russia. About two thirds of the land area of the Arctic is in Russia. Most of it lies in the vast region of Siberia. Siberia stretches from the Ural Mountains in the West to the Pacific coast in the Far East. It covers 8 time zones and it takes about seven hours to fly across it in a big jet. From the air, much of northern Siberia looks like a wilderness of endless forest with only a few roads, towns and villages. Although it is very large, Siberia has a low population density with only three persons per square kilometre. The UK has 262 persons per square kilometre. The traditional life of most of the northern Siberian peoples is based on reindeer herding, hunting, fishing and fur trapping. For most of these groups reindeer herding was the main activity. Reindeer are important to most of these northern cultures. Nadia Takui takes 18 month old Rima Votgyrgina, to watch the reindeer during the Chukchi 'Festival of the Young Reindeer' out on the tundra. Iultinsky District, Chukotka, Siberia, Russia. 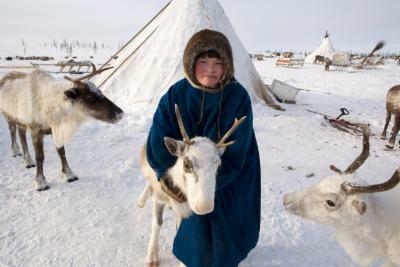 For the herders and their families reindeer were like a department store providing them with most of the things they needed: food, clothing, transport and shelter (skin tents). All Arctic peoples used reindeer skin for their clothing because it’s very warm and durable. Reindeer hair is hollow, and that combined with its dense under fur provides excellent insulation against the severe cold of a Siberian winter. Three Chukchi Yarangas (traditional tent) at a reindeer herder's summer camp. Iultinsky District, Chukotka, Siberia, Russia. Although the vast size of Siberia has ensured that these northern cultures have survived, the modern world has made its presence felt even in the remotest areas. Today it’s only a minority of native peoples who still follow a traditional lifestyle, but traditional activities like hunting, herding and fishing remain important both culturally and economically. In the isolated coastal hunting communities along the coast of Chukotka in Siberia’s Far East, Chukchi and Yupik families still rely on sea mammals like whale, walrus, and seal as an important source of food. In the Yamal region of north west Siberia, reindeer breeding continues to play an important role in both the culture and livelihood of the Nenets people, with 14,500 herders managing 600,000 reindeer. The meat is sold for both the domestic market in Russia as well as being exported abroad. Nenets woman drives a train of reindeer on the migration Yamal. Siberia. Russia. The Nenets have lived with their reindeer in the Yamal region for hundreds of years. Their traditional way of life is now in danger. This is because there is natural gas under the ground where they live with their reindeer. People from countries around the world want the gas to heat their towns and cities. The Russian economy needs it too. As the gas industry develops in the Yamal, roads and pipelines are being built on the reindeer pastures. Will the Nenets be able to continue herding reindeer? Only time will tell. Workers checking the seams of a gas pipeline being constructed during the winter near the Yurharovo gas field. Noviy Urengoi, Yamal, Western Siberia, Russia.